New York - This December 4, Christie’s Books and Manuscripts department will be presenting two sales: Albert Einstein: The God Letter, a stand-alone sale of one of the most famous manuscripts by the 20th century’s most famous thinker (estimate: $1,000,000-1,500,000); and a various owner sale of Fine Printed Books and Manuscripts Including Americana. The latter includes over 200 objects ranging from early printed books to 20th-century manuscripts. The public view will be open at Christie’s galleries in New York from Friday, 30 November to Tuesday, 4 December. Albert Einstein: The God Letter will be on view in New York additionally during 20th Century Week from 5 to 14 November. A major highlight of the science, travel and natural history section is Joan Blaeu’s magnificent Novum ac magnum theatrum urbium Belgicae Regiae. This is an exceptionally colored and important copy—likely the dedication copy for King Philip IV of Spain—of Blaeu’s celebrated town book of the Netherlands, splendidly commemorating the Peace of Westphalia and ushering in the Dutch Golden Age (estimate: $250,000-300,000). Another highlight is Mahmud Raif Efendi’s Cedid Atlas Tercümesi, which is the first European-style atlas printed in the Islamic world. This exceedingly rare, handsome, and complete copy is estimated at $100,000-150,000 and is one of only 50 copies printed. Leading the continental books section is a superbly colored copy, worked with a rich and vibrant palette, of the first edition of Hartmann Schedel’s Liber Chronicarum. The Nuremberg Chronicle is celebrated for its fine and numerous woodcut illustrations, to which Albrecht Dürer is believed to have contributed (Estimate: $250,000-300,000). Also offered in this section are a number of works from the press of the great Venetian printer Aldus Manutius, including first printings of important ancient authors such as Plato, Herodotus, and Lucretius. This section includes the original printing blocks used for the first editions of Lewis Carroll’s Alice’s Adventures in Wonderland and Through the Looking-Glass—arguably the most famous books for children ever made (estimate: $20,000-30,000). The Alice books are among the most successful collaborations between author and artist, and these printing blocks reproducing John Tenniel’s original drawings defined for countless generations the appearances of Alice, the Cheshire Cat, the Mad Hatter and various other blue chips of popular culture. Another unique offering this season is the single-owner collection: Beloved Enchanter: The Arthur Rackham Collection of Nita and Frank N. Manitzas. This collection includes 27 captivating original watercolor and ink illustrations by Arthur Rackham, the famous illustrator who created iconic images of characters like Peter Pan, Snow-White and Rose-Red. Estimates begin as low as $800 and go up to $30,000. The top lot of the sale is a previously unrecorded edition of the official 1823 Stone printing of the Declaration of Independence, with French provenance and in remarkable condition (estimate: $600,000- 800,000). Stone’s meticulously prepared, actual-size, engraved facsimile of America’s founding document remains the most accurate of all existing facsimiles and the only one officially authorized by Congress. The present copy was discovered in an outdoor market in France in the 1970s. 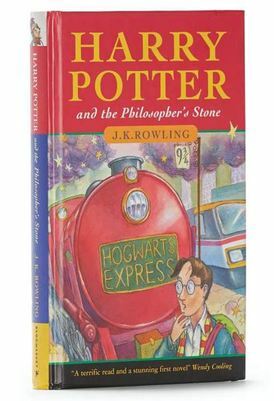 Highlights of the modern portion of the sale include the rare true first edition of the beloved children’s classic Harry Potter and the Philosopher’s Stone, signed by J.K. Rowling (estimate: $45,000-65,000); A Wild Thing Christmas, an original watercolor drawing by Maurice Sendak (estimate: $300,000-400,000); and Kurt Vonnegut’s unpublished wartime correspondence recounting the events that inspired Slaughterhouse-Five, collected in a contemporary scrapbook kept by his family (estimate: $150,000-200,000).